Hermit crabs aren’t high-maintenance pets. While you do need to treat the water chemically to make it safe for your crabs, the dechlorinator isn’t expensive. Other than brine shrimp or hermit crab food, you can feed them some of the same foods you enjoy eating. They don’t eat much, so your food budget will be manageable. Visit a pet supply store and look at the equipment you’ll need for either a single hermit crab or a colony of crabs. You’ll find that the aquarium and the supplies you’ll be buying might cost you less than $100. A larger aquarium allows you can house several hermit crabs almost as inexpensively as a single crab. Buy an aquarium of at least 20 gallons, substrate -- either sand or coconut fiber bedding -- two nonmetal dishes for food and water, and a heat lamp. Add a bottle of dechlorinator, which neutralizes the chlorine in tap water. Add several sterile shells of varied sizes; they'll become the shells your crabs wear. Toss in a few toys for climbing and pushing, such as blocks of wood or pieces of coral. 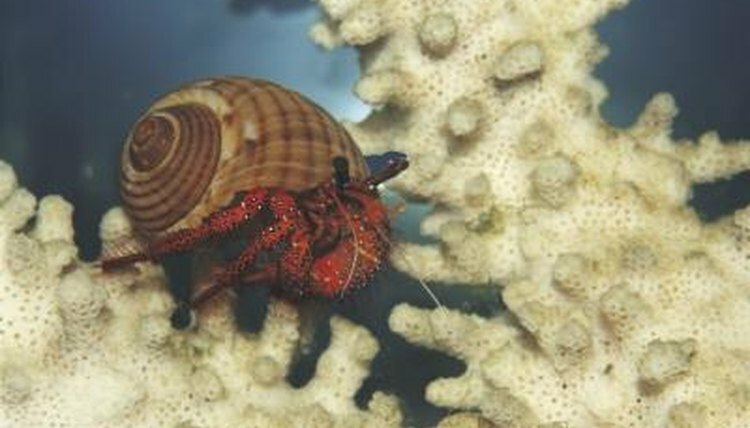 Feed your hermit crabs bits of fruit, such as grapes, banana and apples. They’ll also enjoy plain popcorn, spinach, leaf lettuce and carrots. Smear a taste of peanut butter into the food dish. Feed them hermit crab food if you’ve bought this -- special food isn’t necessary, because they will enjoy a few of the same foods you eat. Your hermit crab is an omnivore, meaning he’ll eat meat, fruits, vegetables and other unseasoned foods, such as plain popcorn. They don’t eat very much. Using dechlorinated water, rinse a few pieces of fruit or vegetables and place them into the tank. Your hermit crabs enjoy shrimp, either raw or lightly cooked with no seasonings. They will also enjoy bloodworms. Again, give them only a small amount, because their appetites are not big. Watch your crabs and keep track of their health. The stress of moving from the store to your home can cause them to lose individual legs. If they lose more than one leg within a few hours, they're goners. Set up an isolation tank for these crabs and keep them comfortable. Monitor your crabs for the possibility of shell fights. While they usually get along, hermit crabs will fight each other for the shells they are wearing. Monitor your crabs because of the risk of shell fights. They begin when the aggressor crab goes after another crab to steal its shell. If the aggressor succeeds in getting the shell off of his victim, the victim will go streaking. If the aggressor follows the victim around the tank, move one or the other to an isolation tank. If the victim is not hurt, remove the aggressor; if it is hurt, move it to the isolation tank for a minimum of three days. Watch both crabs carefully for three days after putting them together in the main tank. If the aggressor resumes harassing the victim, put the aggressor into the isolation tank. Keep him in the tank for one week and repeat as necessary until the aggressor loses interest in the victim. Watch crabs that bury themselves under substrate. They may be moderating their body temperature or they may be molting. Smooth the sand over a crab that has completely buried himself. If he comes out at night, you’ll be able to spot the disturbed substrate and know he’s just resting. If a crab has been buried for more than a few weeks, carefully unbury him and check on him. Use your clean fingers to slowly brush back the substrate until you reach your crab. If he’s molting, he has to stay buried to complete the process and so he stays safe from other crabs who might want to eat him. If he’s still alive, bury him again. If he has died, use a small trowel to scoop him and the substrate he was under out of the aquarium. Dispose of both in a plastic bag. If you smell a rotting fish odor, your hermit crab has died.  Depending on the sizes of your hermit crabs, they might stay buried under the substrate in their tank for several weeks to a few months until they finish molting and it is physically safe for them to unbury themselves. What Does it Mean if Hermit Crabs Put Their Feelers Together?